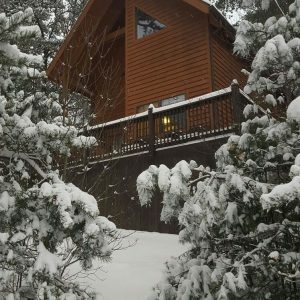 If you’re looking for cabins near Grandfather Mountain and the rest of the hiking, biking, whitewater rafting, golf and ski activities in the area – our Mountain Dream Cabins on the Blue Ridge Parkway are just for you! Relax and enjoy our hot tub, under the stars on the porch with a gorgeous view of Humpback Mountain or roast marshmallows in the outdoor fire pit! Our two identical cabins are so cozy and comfy with fire places, gorgeous knotty pine interior, cathedral ceilings and more! They are far enough apart for you to experience a private mountain vacation yet close enough for large gatherings of up to 12 people. Each cabin sleeps 6 people comfortably. Nestled in the heart of the Pisgah National Forest “Land of Waterfalls” we are within 5 minutes of the Orchard at Altapass, 10 minutes of the area’s best gem mining, 15 minutes of the nationally acclaimed Penland School of Crafts, 10 minutes of the beautiful Linville Falls Recreation Area, 25 minutes of Mount Mitchell, 40 minutes of the ski slopes, 20 minutes of Grandfather Mountain and 10 minutes of Linville Caverns. 45 minutes to Asheville, Boone and 30 minutes to Blowing Rock. Trout Fishing Pisgah opportunities and hiking trails in the Pisgah National Forest surround us in all directions! We pride ourselves in offering our family’s two cabins at the lowest prices on The Blue Ridge Parkway. 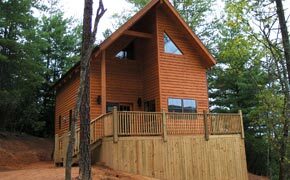 You will not find newer, nicer cabins on The Parkway for less! We cut out the middle men; rental agencies, property managers and realtors who charge 30% commissions to property owners…You go direct through us and save! 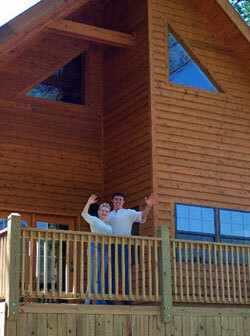 Our cabins are two of very few that are located directly off the Blue Ridge Parkway. We offer seclusion, convenience and beauty! Both cabins are identical and have everything you need for the perfect mountain vacation. Complete with two bedrooms featuring queen sized beds, two bathrooms with ceramic tile, queen sleeper sofa, and best of all, front porches with hot tubs overlooking Humpback Mountain! We have everything to make your romantic get-a-way or adventure filled trip something you will never forget! We are in the center of it all and there’s plenty to do all year long! There’s an abundance of activities and attractions; visit the North Carolina Mineral Museum (FREE), enjoy the thrill of Gem Mining NC at several local mines, experience Grandfather Mountain Highland Games, Grandfather Mountain Hiking Trails, Wild Life Habitats and Mile High Bridge. 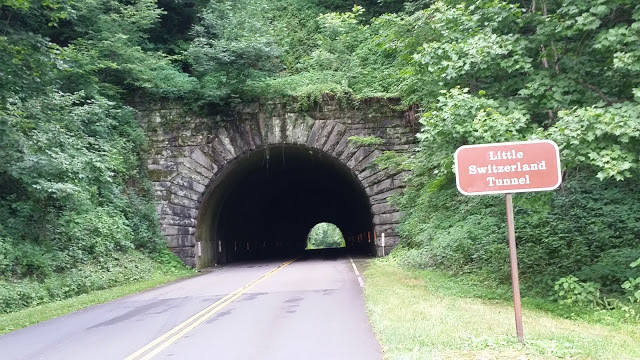 Whitewater rafting, mountain biking, horseback riding and zip-line canopy tours are perfect for the adventure seeker or take a drive on the Blue Ridge Parkway, “America’s Prettiest Ride.” Skiing and snow tubing are popular in the winter with several places to choose from. Take a slide down a natural waterslide in the summer; we know all the secret spots that only locals know about! Of course there is plenty of shopping and dining close by, and the fall foliage is nothing short of spectacular! There’s so much more to see and do, we know the area well and we’d love to help plan your itinerary. Feel free to contact us if you need additional information and we hope you’ll visit soon! Once you do, we’re sure you will be coming back year after year.